The present invention relates to a color detector with one only output for rainbow colors. A color detector consists of a light source a photo detector and a processing electronic. It is used to detect a color from a surface or from liquids. Very popular, it describes all colors with a scientific approach in U and V coordinates. 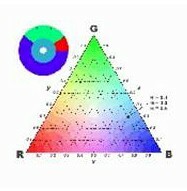 Color detectors in their simplest form produce an output for a specific color from a surface or liquid. This is done with specific lights or specific filters. 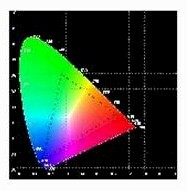 Color sensors of this kind are typically used in applications with known colors like in the printing industry. Other known devices are sophisticated color sensors for scientific purposes. They always relate to CIE or Maxwell's triangle and are manufactured with various technologies. All of these color sensors have the disadvantage of being too simple or too sophisticated. None of them fulfill the need from the industry which wants to measure or "teach" a color in the one axis rainbow spectrum. 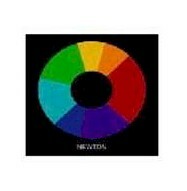 The present invention represents a new method of reading colors. The color sensor is relating the output to the rainbow colors starting on blue over green and yellow to red and into violet. This is made with flashing colored lights in blue green yellow and red built in to the sensor with a specific angle for scattering and a photo detector. Connected to the photo detector is a microprocessor. The microprocessor calculates the output to the rainbow colors and produces an output. with a light of a specific wavelength. photo detector channel by allowing the reflected light from the surface to be absorbed in unused other light channels. Both sides are symmetric. The geometric configuration of the colored lights liquid. Colors are subtracted to conclude proper color. The following picture shows an example with 3 colored lights blue green and red. Shows an example with 4 colored lights blue green yellow and red. Light is shifting from one color to the next. Periodically one light is switched on and off one after another. Shows an example with 4 colored Lights blue, green, yellow, and red. Output from the photo detector of the rainbow color sensor. Each light makes an output in the photo detector. The scattered light from a surface is known by its wavelength. Each light when switched on results in an output in the photo detector. The following mathematics shows an example with 4 colored lights blue green yellow and red. For more or less amounts of colored lights the same logic is valid. Amplitudes have capital letters. Wavelengths do not have capital letters. 1. Color sensor for measuring colors in a rainbow sense in one axis along the wave length. 2. Light channels in the housing in a way that unwanted reflection is diverted. 4. The rainbow sensor can be used in a larger spectra from ultraviolet to infrared. 5. The rainbow sensor can be used in smaller spectra in any specific color range.